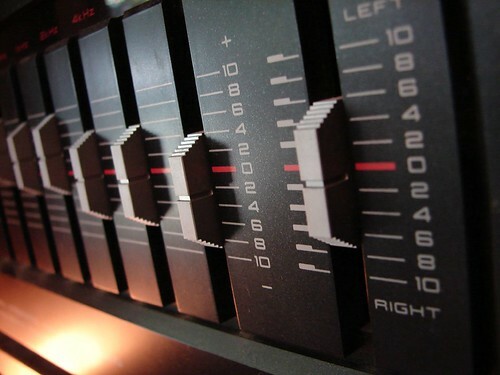 If you have any experience with music or production, you’ve probably stumbled across what’s called an “EQ.” If not, it’s a boxy-shaped device, usually found near a soundboard, that’s equipped with roughly 32 adjustable faders to fine-tune the frequencies of a room for its optimal acoustics. Every room reflects sound differently and varies depending upon conditions like temperature, instrumentation, and many other elements. Adjusting the EQ is all about balancing the complete spectrum of sound. Years ago, when I was a musician, I was working with a producer who encouraged me to play guitar lines that would sit on their own waveband. What he meant was, don’t play parts that would interfere with other instruments—like a piano for instance. Instead, he challenged me to play parts to complement the piano, perhaps in a different voicing or octave to give the piano space in the full spectrum of sound. Maybe even a counterpart to draw attention to the piano. Likewise, my guitar part was then granted its own space and support. Consequently, each instrument was working together—tunefully—and the complete spectrum of sound was in balance. Like a piano needing separation from the guitar, in business (and in life), people need space for success. If you’re participating in a project, team, or venture, it’s crucial to give thoughtful consideration to your part in relation to the full spectrum of sound—even if you’re just playing a back-line part. What’s more, it’s important to trust the rest of the band to carry its own weight. If you’re the manager, remember—the producer never grabbed the guitar out of my hands and did it himself, though he could have. Regardless of your instrument, play whatever best complements the song and brings balance to the mix. All that matters is the song—every instrument in tandem. So, what faders need to be adjusted to balance the mix? What parts need to be rearranged?